Uma Parajuli a resident of Baajhpokhari-3, Kavre shows her family’s water collection pond. To cope with water shortage, residents in the area collect rain water in plastic ponds for later use. KAVRE, Dec 29: Uma Parajuli of Baajpokhari - 3 had received Rs 50,000 as part of the first installment of the house grant provided by the state. Since her village is always in shortage of water, she had to transport water from a far away source for constructing the new house. 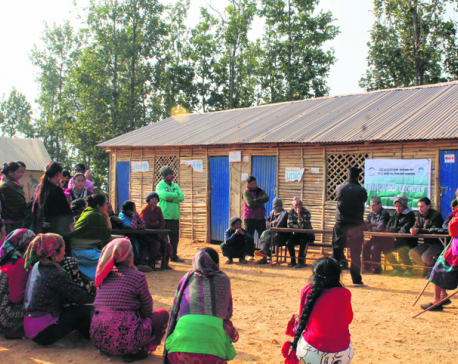 As it is concrete home, it needed even more water than a traditional mud and stone home, Parajuli said. But she had never expected that the water alone would cost her family so much. She had to spend around Rs 40,000 to buy water. Water shortage has been a long standing problem in Baajpokhari area. During the recent decades, many water sources in the locality have dried up. According to an ICIMOD study, some decades back there were around 60 water sources in and around the area but only a few are left now. “I had to pay Rs 1 per liter for transporting water from the Roshi River. If we had water facilities in our locality, I would not have to spend such a hefty amount to transport water,” she said. “Everyone in the locality is also similar amount. The only way to construct home is to transport water from Roshi River. This is a huge cost for us to pay.” Roshi is the nearest river from Parajuli’s village. Though residents of the locality traditionally preferred mud and stone houses, post earthquake the preferences have changed. Presently homeless families are constructing concrete house. One of the major reasons for the shift in preferences is to become eligible for the state grant for home construction. The state grant for home is provided only if the applicant constructs a concrete house according to its own construction design and standard. Impact of climate change is visible on the day to day life of the district’s resident. Women in Kavre, who are commonly associated with traditional farming, report that the climate is gradually getting drier. This, they report, has affected crop production in their farms. “Crops that used to grow and flourish in our farms are gradually declining in growth and yield. It’s becoming hard to grow some traditionally grown crops in our farms” Nanu Ghatini a member of a women climate change awareness group said. Ghatini’s group is one of the many women groups formed by ICIMOD to raise awareness about climate change and to assist in assimilating and mitigating them. Among others these groups are provided tools and knowledge for preserving water sources. One of the methods these women have used to preserve water stock is constructing plastic ponds. “We have made 70 plastic ponds. 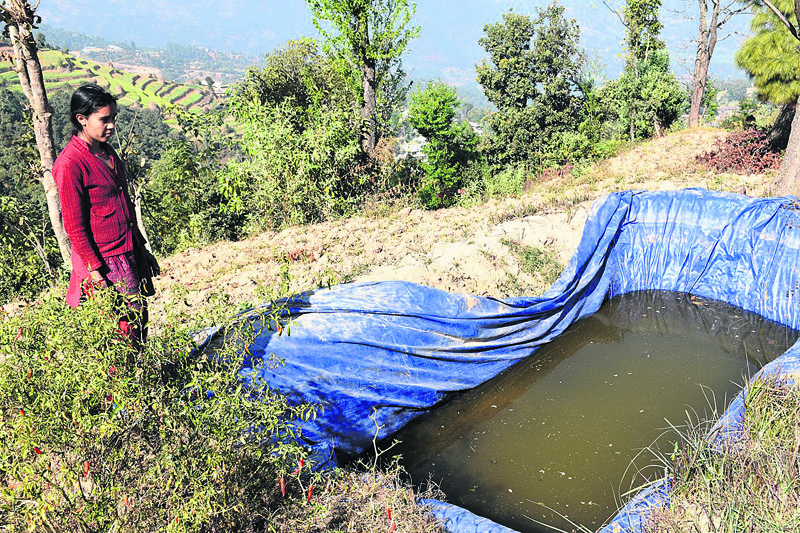 These ponds can hold a total of 7000 liters of water,” she reported. “We do not want to waste water. We have learnt to recycle it. On the other hand artificial ponds help us to conserve water for critical times.” These women have recently come together by forming an organization with the stated purpose of conserving water and preserving environment.